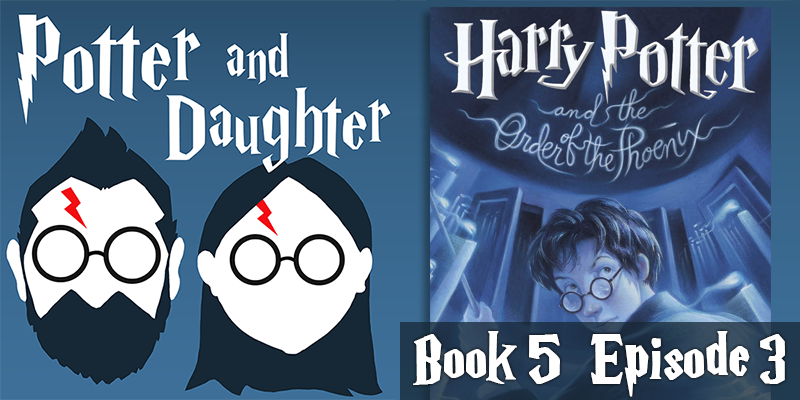 In episode nineteen of Potter And Daughter Joel and Lily discuss Harry Potter And The Order Of The Phoenix chapters 13-19. Harry begins to see what happens when the paranoid and fearful hand of The Ministry begins to tighten its grip around Hogwarts. Harry has his first of several detentions with Deloris Umbridge and her “enhanced” punishment techniques. Dumbledore is still keeping his distance from Harry, and Hagrid is nowhere to be seen. Hermione advises Harry to take his, and the rest of the students’, educations into his own hands not to keep their grades up, rather to keep them alive in the dark days to come.